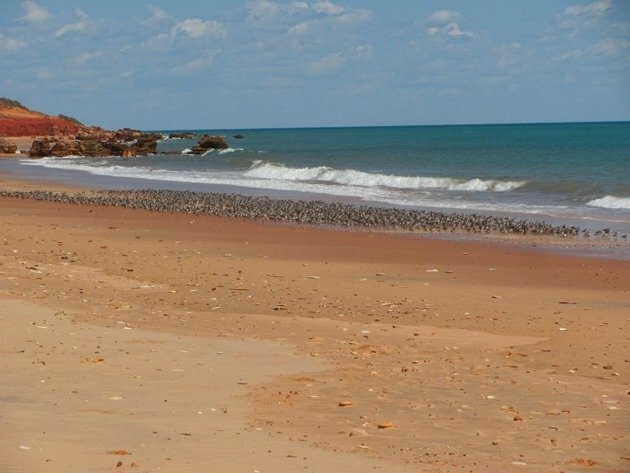 Reddell Beach or Riddell Beach, depending on your source of information is a very picturesque beach in Broome between the port of Broome and Gantheaume Point. 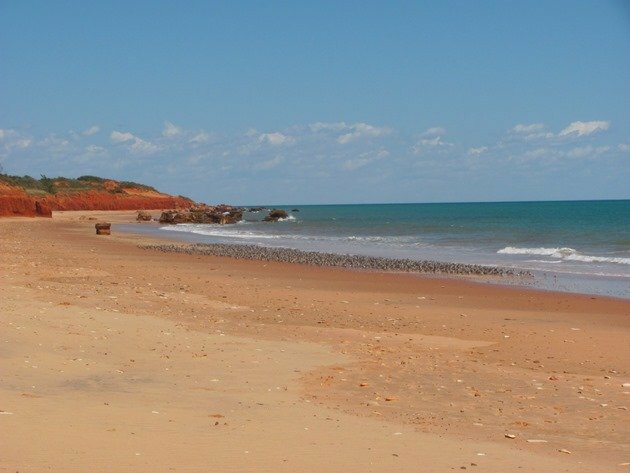 It varies from Cable Beach, because rather than white sand and white sand dunes it offers pindan red cliffs and the dirt does stain! 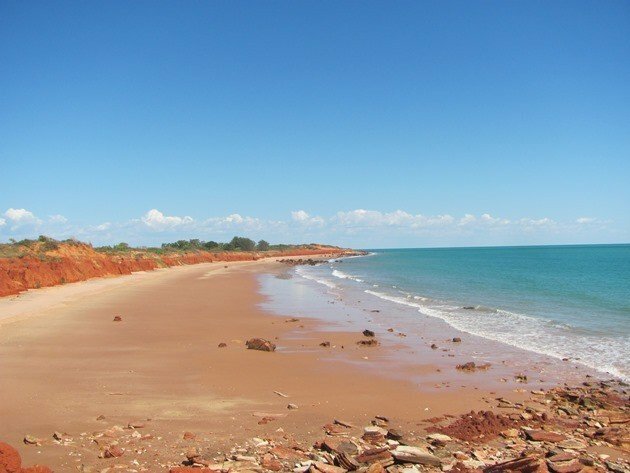 The beach is in fact named after Captain John Alfred Reddell, who was murdered on 20th October 1899 on board the “Ethel” when he was returning to New Zealand on one of his journeys to transport supplies for the pearl luggers working out of Broome. There was a mutiny aboard the brigantine “Ethel” and several crew members were massacred as well as Captain Reddell. 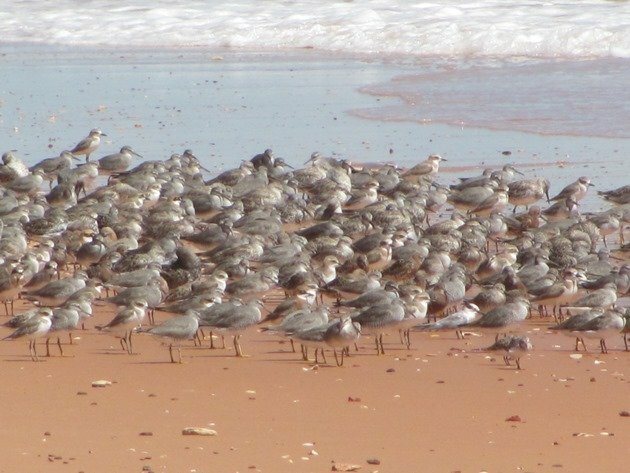 This past week has seen thousands of shorebirds roosting on Reddell Beach having abandoned Simpson’s Beach near the port now our winds are starting to change as the season changes. Every evening the shorebirds have started to migrate to the northern hemisphere and over the coming weeks we can expect to see a lot less migratory shorebirds along our shoreline. Access to Reddell Beach is from several car parks and involves clambering over some pindan dirt to access the beach. Beware the red dirt-don’t wear white! 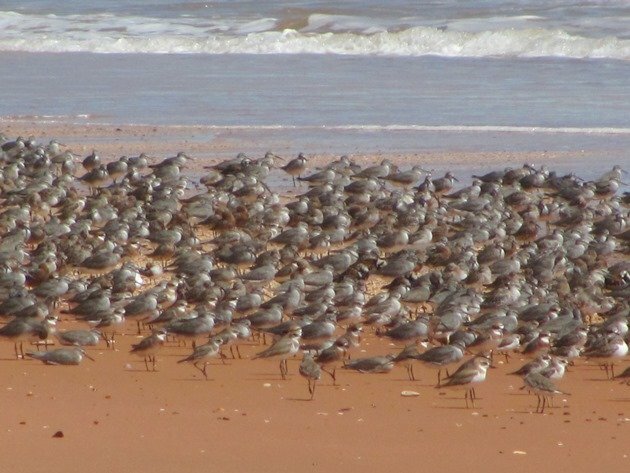 The ideal time to observe shorebirds on this beach is after the tide has turned and the shorebirds have relaxed after being pushed closer and closer to the cliffs over several hours. You are then able to position yourself behind the shorebirds and enjoy their magnificent breeding plumage! The tide falls very fast on this wide flat beach and within an hour you have ample room to position yourself on the beach behind the thousands of shorebirds. The shorebird variety is excellent on this beach at this time of year and there are Great Knot, Red Knot, Grey-tailed Tattlers, Terek Sandpipers, Grey Plovers, Red-necked Stint, Curlew Sandpipers, Greater Sand Plovers, Lesser Sand Plovers, Oriental Plovers, Ruddy Turnstones, Whimbrel and all in varying breeding plumage! 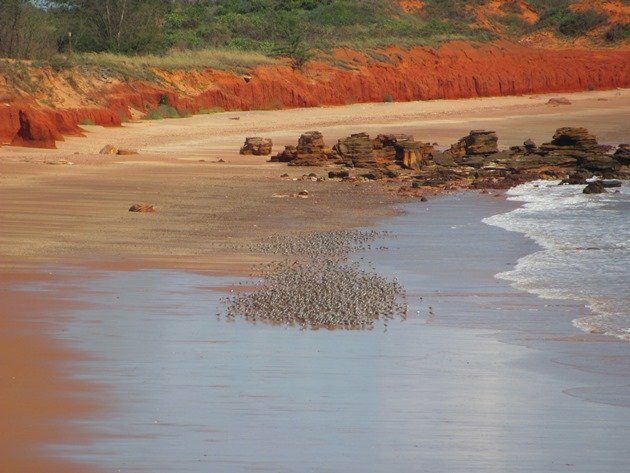 There are very few shorebirds that are plain grey this time of year and many almost match the colour of the red cliffs. 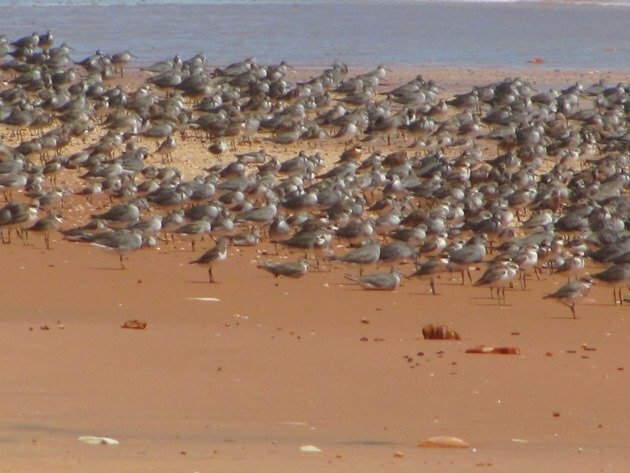 Curlew Sandpipers and Red Knot are the closest match to colour when it comes to the pindan red dirt along the top of the beach! There is one odd bird in the photo below and that is a lone Oriental Plover, which I have enlarged for you below! 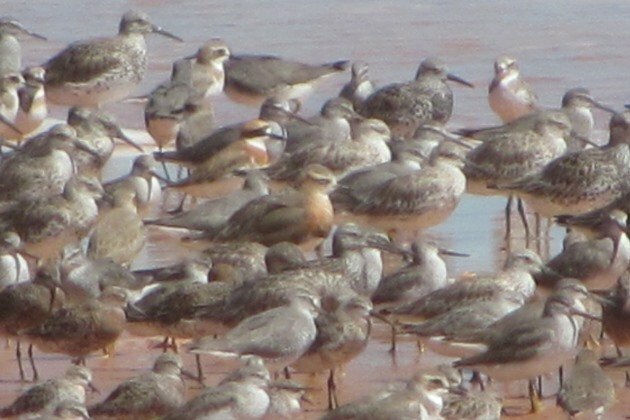 Oriental Plover in the middle of the flock! It may look quite overwhelming to have so many species together, but at this time of year it is a lot easier to identify them than it would have been a few months ago when they were all pretty much grey! 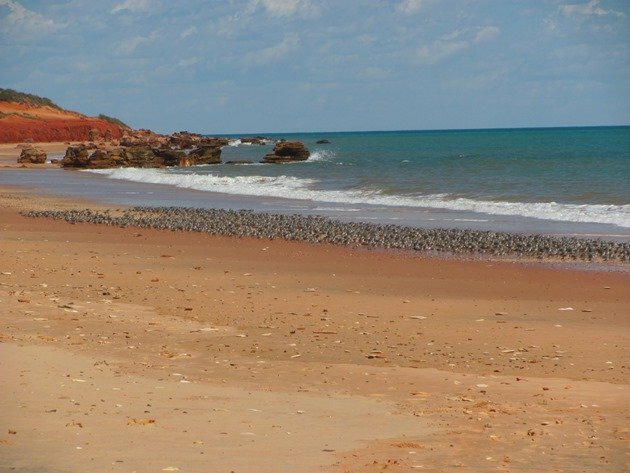 This is a particularly good beach in the Broome area for Lesser Sand Plovers and the male birds are in spectacular plumage this time of year. 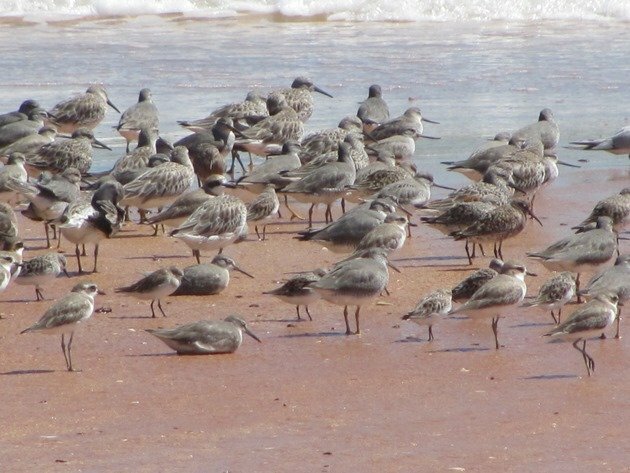 Their brown breast bib has a black outline unlike the Greater Sand Plover and you can see one in the sandy area in the middle of the photo below. 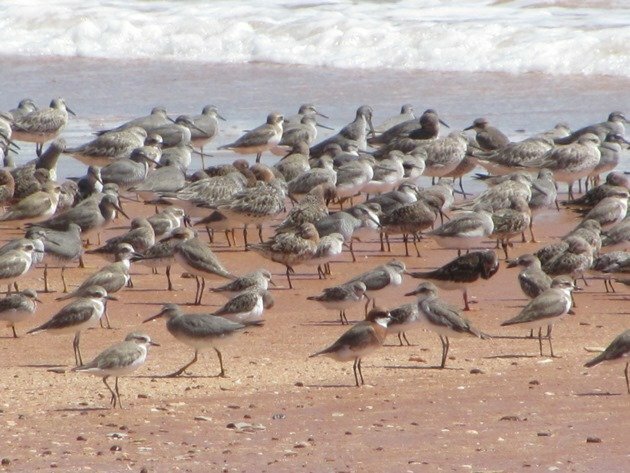 A good variety of shorebirds! Grey-tailed Tattler are the species that we observe lying on the wet sand after the tide has turned more than any other species and most often at the back of the flock! In fact we are still observing our Grey-tailed Tattler that was flagged in Taiwan on 4th August 2012 and returns to Broome each year in the non-breeding season! It will no doubt soon head north and we will watch out for its return later in the year. The Terek Sandpiper that was flagged in Japan and has been with us for several months now has also moved to Reddell Beach and we also hope to see it return each year during the non-breeding season. Grey-tailed Tattlers relaxing on the wet sand with other shorebirds! Of course not all of our shorebirds will migrate, because some species remain here the first year after arriving from the north last year and also we have our resident shorebirds. The Red-capped Plovers will soon be nesting along our coastline and also our Pied Oystercatchers will start to nest from the first week of July. 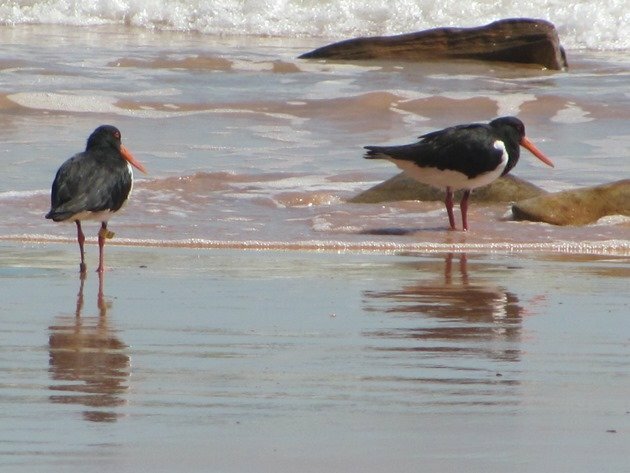 In fact the pair of Pied Oystercatchers that nest on Cable Beach each year are currently residing on Reddell Beach and will soon return to their territory on Cable Beach. 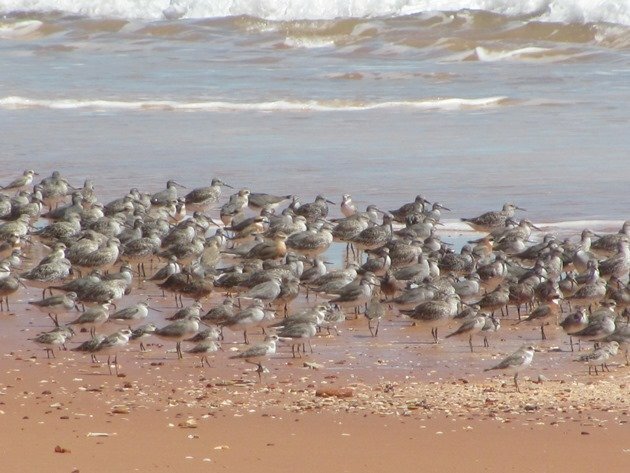 Over coming weeks the shorebirds will leave Reddell Beach for the northern hemisphere, but the beach will remain a beautiful place to visit with some interesting history! What an amazing species composition!